Why Indian Students Still Fear Taking Competitive Exams in digital platform? As summer temperatures soar, the tensions of students rise proportionally. With competitive exams at the center for most of the aspirants looking for a good technical institute, giving exams efficiently is definitely the prime concern. One of the toughest and most challenging exams at graduate level in India, the IIT Joint entrance examination was conducted with two formats – computer based and on paper. This year, like the last year, saw a vast population move out of the urban centers to tier II cities so that they could opt for offline JEE. Cities such as the outskirts of Thane, Amravati, Pune, Pondicherry were flooded with students as these supported the on paper exam. The JEE for Cities such as Mumbai, Kolkata, Bangalore was made compulsively computer based. A widespread scare among the aspirants for choosing the computer based exam was observed, although on a lower side as compared to last year. For some, it’s the confidence of paper – pencil pattern to which students are traditionally used to matters. For some, since the coaching institutes suggested that the computer based examination would be risky as it involves technical glitches and dependency on center, it was better to opt for paper exam. We explore why we are still hesitant to adapt the technological upgradations. 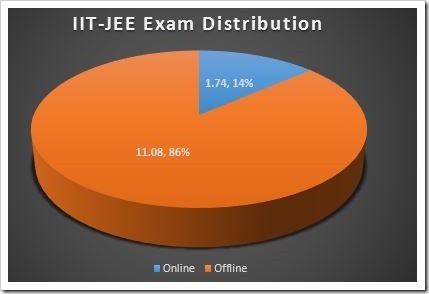 The purpose of digitizing the examinations was to let students choose the preferred day and timings in the given JEE Window, so that it’s much easier on both the students, and the JEE Evaluators to do it in installments. 1. One could not change the answer once finalized in the traditional paper pen exam, as the answers had to be shaded dark on the answer sheet (which would be scanned and evaluated later). In case of computer based exam, one could change the answers by a click – convenience much needed for students amidst high tension and pressure. 2. Digitizing the exam would also mean the evaluation is fair and processed automatically; the generation of score sheets would be quicker and access to results and further decision on admissions would be faster. As the IIT JEE authorities pound efforts to give comfort to students, the stats show that students still prefer the traditional format on paper. 1) Previous Fiasco’s: Evidence such as the CAT Examination fiasco not long back, suggest that the first time use of a digitally improved mechanism involves a larger risk factor. We are used to referring papers from the past and the methodologies our ‘seniors’ used in solving the same. Thus, mind wanders off to choosing the safer route. 2) The fear of an abeyance: A glitch or a failure which can be counted to many such as electricity issue, bug in the software, machine dependency or crashing of system evidently concludes, a paper system is a better option. 3) Traditional Comfort: When we sit for an exam on a desk rather than on a computer – we get to see the whole question paper as against on a computer – where one question pops up sequentially. 4) Use of Paper Tests: A student having studied in a coaching institute or at home, has studied for the past two years on paper, and is habituated to such an environment. Preference automatically goes to the paper test. While it wouldn’t have been a topic of discussion, had the JEE computerized the whole procedure at once – the fact that they are upgrading phase by phase makes me wonder, if they too, like the students, doubt about the robustness of the digital environment as well. It would be great to know your comments – What mode of exams would you prefer (if you were a student)? Computer based or on Paper? "Why Indian Students Still Fear Taking Competitive Exams in digital platform? ", 5 out of 5 based on 1 ratings. Cleartrip Introduces Online Flight Reschedule Feature! I feel that the main reason why Indian students fear competitive exam is the hype created around it. Competitive exams is a very broad spectrum, attempting a competitive exam requires a great deal of concentration and hard work. students won’t fear about online exam, indians always like to perform their jobs in traditional way. They won’t risk and lack on tech education. They allocate studets with different time slots, and later groups will be with some added advantages, regarding the pattern of exam. As children we all grew up solving papers on wooden desks, and not on desktops. When for all of our childhood (where exams are more than just tests), we’ve given these exams turning answer sheets one after the other and where asking for more answer sheets meant better answers, I really think that it is the fear of the unknown that makes students stay away from computer based exams. A sudden shift from a well structured answer to a single click is something I think that is fearful enough for young minds to try stay away from. Don’t you think so? ?